In June 2010, two UH-1Y Huey crews with Marine Light Attack Helicopter Squadron 369, the “Gunfighters,” flew to the aid of ground forces in Helmand province, Afghanistan who needed ammunition to continue fighting an intense battle. The helicopters landed into heavy fire to deliver the ammunition and supplies, and as the lead Huey lifted from the hot zone, its pilot – Golden, Colo., native Maj. Tres Smith – was severely wounded. His crew chief, Staff Sgt. Bart Davis of St. Charles, Mo., administered first aid to Smith and held his unconscious body off the helicopter’s flight controls so the co-pilot could return them to the Camp Bastion hospital. 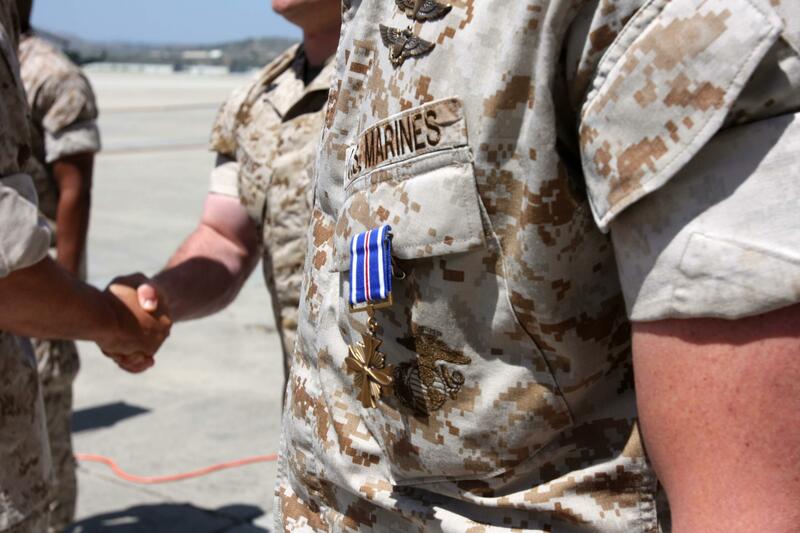 On May 24, 2011, Maj. Gen. Thomas Conant, the commanding general of the 3rd Marine Aircraft Wing, awarded Davis and Smith the Distinguished Flying Cross for heroism during a ceremony at Marine Corps Air Station Camp Pendleton. Smith addressed the audience after the presentation of the awards, but had little to say about his own experience. Davis and Smith gave the audience a “Gunfighter salute” – flexing both arms over their heads – before adding their name patches to the Gunfighter “Honor Roll.” The squadron celebrates its distinguished Marines by adding their name patches to a special wall inside the hangar.